While many online casino games are designed around familiar themes, rules and styles, they sometimes stray into the downright crazy. Often the rules stay tied down to the basics, but the world’s leading software providers occasionally fall off the creative cliff with games that raise more eyebrows than they do coffers. Let’s take a look at the weirdest, craziest, most questionable online casino games across the Web. 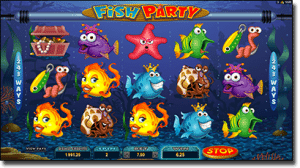 Micrograming has released its fair share of high-quality and perfectly designed slots, but Fish Party sits firmly in the “weird” and “why did they do that?” category of their portfolio. This 243-way slot has a deep sea theme, halfway between Finding Nemo and Shark Tale, although the slot itself isn’t anywhere near as energetic or entertaining as those films were. There are some exciting ways to win, with Wilds and Scatter symbols appearing often, but it’s hard not to be distracted by the weird animation and theme in general. 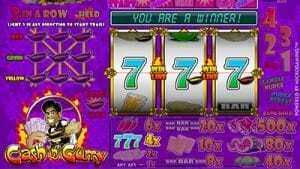 The slot is saved by the fact you can win huge amounts on a five-of-a-kind, and the free spins net you 15 juicy ones, but it’s hard to look past how odd the design and theme are. “Fishy” probably isn’t quite the word to use for this slot, but its weirdness is definitely off the scale. Spingo is quite unique, blending the best of roulette and bingo to form what is a weird yet highly rewarding online casino game. 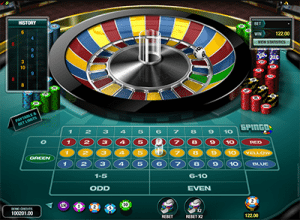 It plays like roulette in that you place a bet on a number and/or any number of outside bets. However, instead of two colours there are three, and it goes from 0-10 as opposed to 0-36. Numbers 1-10 have three main betting options: one for each colour. So, if you were to choose one-blue, and the number one ball is called out (like in Bingo) before landing on the colour blue, you win. You can also bet on odds and evens, colours, zero, green (a fourth colour with a single panel) and halves. As you can see, the game shares more obvious similarities with roulette than it does bingo, but it’s still a unique and weird spin on both games that may either be too childish for you, or just the right amount of crazy to give it a go. 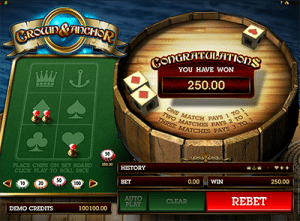 Crown and Anchor is one of the more unique casino games available online. It’s also incredibly easy to understand and play, which makes it rather rewarding. It relies on a classic theme, and has players choose one of six symbols: the heart, club, spade, diamond, Crown, or Anchor. You bet between $1 and $500 on these symbols. Three dice are then thrown, each landing on one of the 6 symbols (there can be double-ups). If two dice land on your symbol, it pays 2:1, while all three pays 3:1. You can of course bet on all six symbols. It’s a fairly stock-standard dice game: you’re simply betting on the symbol to appear at least once from a spin. But few casino games are like it, and that’s why it makes this list. There’s just something not quite right about this slot. You really need to play it to understand it. It’s filled with eerie sounds and animations of cartoon cats that are straight out of your nightmares. There’s probably a reason why this slot is buried deep down the standing in most online casinos. That said, it’s probably worth playing: it offers up to 25 free spins, and along with multipliers makes it one of those “nightmares” that are probably worth sitting through. We love curry just as much as anyone, but a slot theme based off of it? We can smell the after-morning sweats already. The weird thing about this slot isn’t even its name, it’s the symbols in it: there are papadums, chillies, spices, and vegetables, all of which are common ingredients in Indian food. Perhaps this was made to appeal to a very specific market, but it’s a bit of a stretch. It’s made by Microgaming, who has a frequent place on this list, so it’s probably no surprise that they’ve gone out and created something like this. But did you ever expect to see a slot based on a theme of curry? 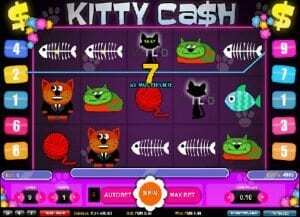 Online scratchies aren’t uncommon, but this one takes the cake not only for weirdest, but also downright hilarity. For one, the game of golf probably isn’t exciting enough to justify making a casino game out of. It would almost be like creating a slot machine with a chess theme (which probably exists but we couldn’t find it). Secondly, some of the animations and sounds are simply hilarious. 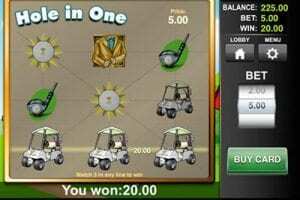 If you manage to win on one of the golf buggies, the vehicle jumps up and revs like a supercharged V8 car. Now, if you’ve ever driven one of those around a golf course before, you know that the last thing they can do is hop around and rev the engine. Sometimes it’s even faster to walk ahead of one then it is to ride in one. Aside from that, it’s your stock-standard scratchies game … just with the added grind of a long game of golf. Want to try some of these strange games and plenty other bizarre titles online? Our top-recommended real money casino for players from United States is Raging Bull Casino, which boasts some of the best slots and table games on the Web, plus a variety of casual and niche titles.